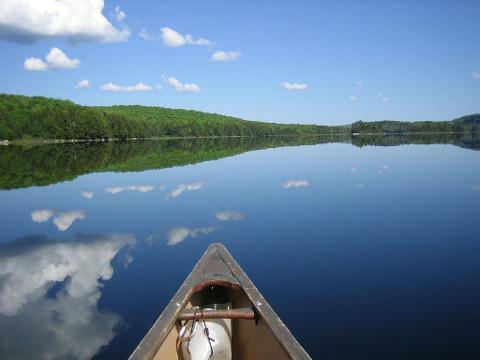 People with a sense of adventure will love this Algonquin Park canoe trip! It is geared towards beginners who want to sample more than 3 days of Ontario wilderness. By running the canoe trips midweek we will also avoid much of the crowds found on busier weekend routes. We provide all food, permits, a knowledgeable guide, and all equipment (except personal items like sleeping bags & flashlights – a packing checklist is provided). To make it even easier for tourists there is an optional Toronto to Algonquin Park shuttle service. We will meet you at Rock Lake in Algonquin Park at 1pm. For those who chose the shuttle service we will pick you up at Finch Subway in Toronto at 8:30am. Once we arrive in Algonquin Park we have get our permits and then start unloading equipment and packing the canoes. Our experienced guide will teach you the basic canoeing strokes, show you how to properly load and secure a canoe, and go over safety issues like what to do if you tip, or what to do if you see a bear. We will also show you the Algonquin Park map and give you a brief history of the Park as well as where you will be canoeing for the next four days. After the canoeing lesson you start paddling downstream on a lazy river. Soon the river opens up into Rock Lake, which you will be canoeing across. Rock Lake is a gorgeous lake that received it’s name from the several sheer rock faces that surround it. On a few of these cliff walls there are some Native pictographs that still remain after hundreds of years. On your last day you will stop by one set we have discovered (weather permitting). At the end of Rock Lake there is a short portage to get around a weir. During a portage you empty the canoes, carry the gear to the other end of the trail, and then return to carry the canoes on your head. Don’t worry – it’s not as hard as it sounds, though you will be thankful that we use lightweight kevlar canoes! 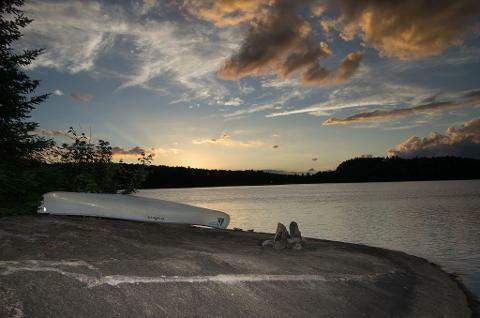 Now you are on Galeairy Lake, where you will set up a campsite. Thisincludes hauling the canoes up onto land, putting up the tents, collecting firewood, and starting a campfire. Of course there is still enough time to go for a swim, or relax in the warm afternoon sun. Dinner will consist of fresh food made at camp. We typically have chicken fajitas on our first night, with banana boats for dessert. Fine dining wilderness style! Today is a travel day. You will pack up your campsite, load your canoes, and start paddling toward Pen Lake. Depending on the group make up and the time of year there are two route options that you will consider. One route has you backtracking slightly and doing lots of canoeing with two short portages. The other route option is less canoeing but one long portage and a very short one. Some people like the long portage because it gives you a chance to hike in the forest, but most people choose the canoeing route. Today is a relaxation day. You are not moving camp so you have more free time. Usually the group will have a lazy breakfast around the campfire and then head off in empty canoes searching for moose. At the beginning of summer moose mostly graze on aquatic plants, so you have an excellent chance of spotting them from your canoes as you paddle along the shoreline. 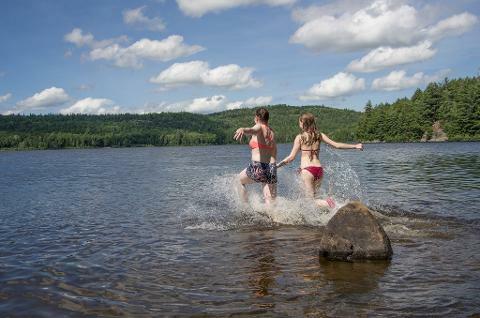 For a destination for lunch you may do a couple of portages and go to Welcome Lake and the big sandy beach there. Or you may canoe to the end of Pen Lake and do the short portage into Clydegale Lake. There are a couple of good moose viewing areas here. You get back to camp mid-afternoon and have time to relax, swim, or practice your canoeing strokes. After an early morning breakfast we pack up camp and start canoeing for home. An early start gives us the chance to spot moose or deer as they come to the lake to drink at daybreak. On the way back we will stop at a cliff face to look at a pictograph. These were painted by Natives many of hundred years ago, but many have faded due to exposure to the elements or rising water levels. We have managed to find one that is still easy to see. We usually get back to the parking lot around 11am. After storing the canoes and gear away we leave for Toronto, getting to Finch Subway around 4pm.